In the distance one the road below, we can see the two Swiss cyclists that we passed not long before this climb. From San Agustín, we had to backtrack towards Pitalito to get back on the main road. This part was mostly downhill, and we made good time for the first 30 kilometers. Back on the main road, we encountered another pair of bike tourists traveling in the same direction. They were a brother and sister from Switzerland, and we saw them again when we arrived in the small pueblo of San Juan Villalobos. They had pitched their tent next to the police station at the entrance to the village. We thought about joining them but ultimately decided to camp at the school instead. A boy feeds sugarcane stalks into the machine that turns them into juice. The old method for operating a similar machine was to use horses or mules to turn the rotors. 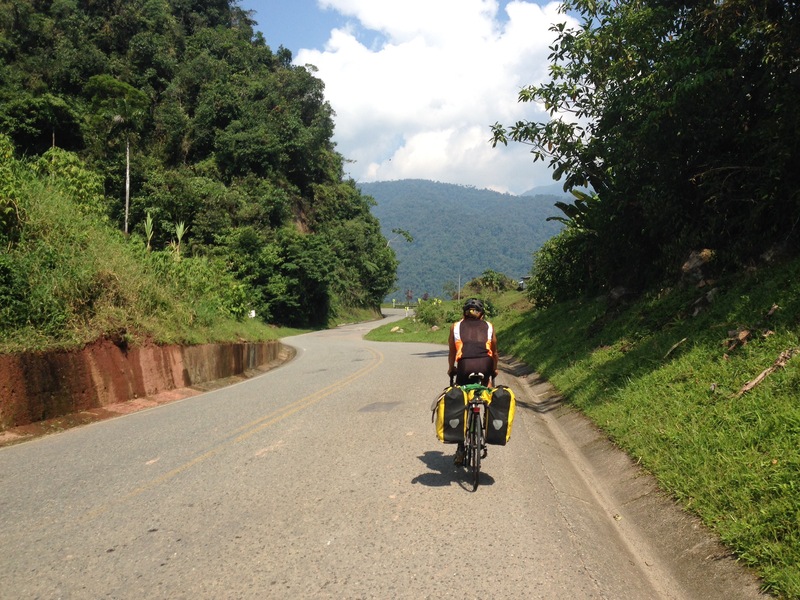 The next day we rode to Mocoa. The road became increasingly lush with green trees and birds surrounding us, and there was nothing but jungle on the mountainsides for as far as we could see. We stopped at a panela factory in the middle of nowhere, where we observed a family making panela from sugarcane. A young boy was feeding the caña into a machine that would crush it, and juice was flowing into a bucket on the other side. 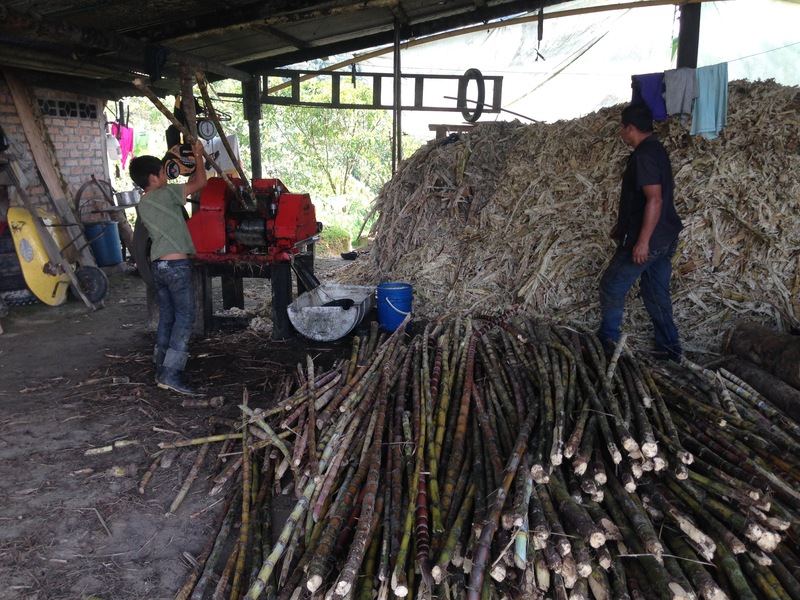 Two other men were working on filtering and boiling the sugarcane juice, or guarapo. Lenin and I got to drink a cup of the sweet juice before they cooked it. We thanked them and continued down the mountain, eventually coming to Mocoa.Here, we stayed with Will, an American ex-pat who was working as an English teacher and had been living in Colombia for the past two years. He was actually in the process of moving out of his house because the landlord, who was also the owner of the school where he taught, hadn’t paid the rent in 18 months. This man was apparently also a priest, and his whole family had been run out of town because he owed so much money to so many people, including Will, who had not been paid in a while either. 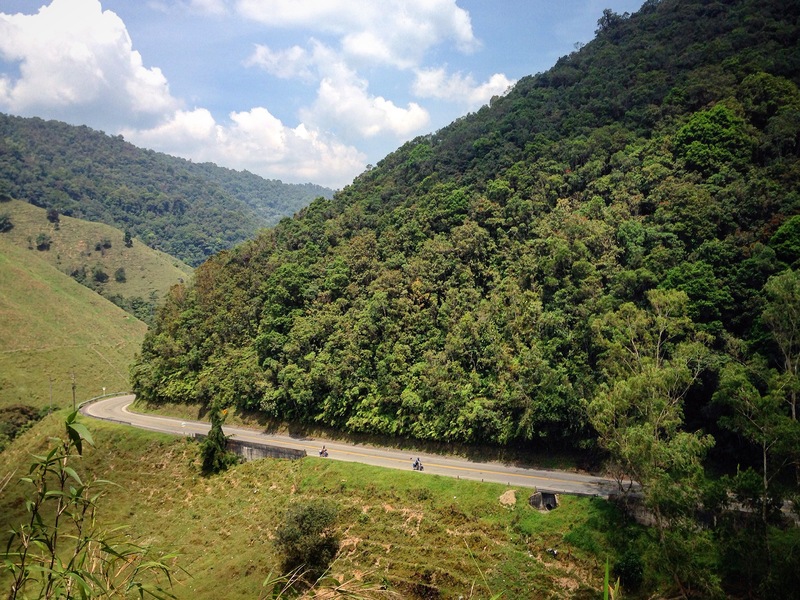 The road to Mocoa winds through lush, green jungle and mountains. Will may have had a bit of an obsession with Yaje, or Iowasca. It was interesting to learn about this spiritual ritual that the indigenous of the area partake in. It consists of two plants that, when combined and brewed in a tea, have a hallucinogenic effect. Will had nothing but good things to say about it, and he barely spoke about anything else while we were there. He claimed that it brings people closer to nature, and that he had seen the future twice (he takes Yaje every month). Neither Lenin nor I had had any desire to try this before, but after talking with Will, we were definitely intrigued. Posted on 28 March 2017, in Bicycle Touring, Colombia and Ecuador. Bookmark the permalink. Comments Off on San Agustín to Mocoa .